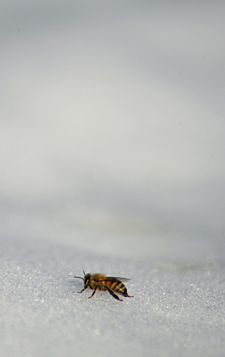 A lone bee ventures out of the hive in winter. 9:12 a.m., Feb. 3, 2011----Baby, it's cold outside. Time to put another log on the fire, wrap up in a thick sweater, or make a steaming mug of tea. These human adaptations to cold weather are quick, easy and get the job done. Even more effective, of course, is the central heating that is ubiquitous in our homes, offices and schools. It takes a lot more effort for other mammals, birds and insects to make the necessary adaptations to survive harsh weather. Next week, we'll look at animal and bird strategies; today we'll see how insects make it through the winter. In many species, insects adapt to the cold by dying off; it's the larval stage of the species that goes through winter. Insects that do over-winter as adults usually enter a hibernation-like state called diapause. “Insects don't technically hibernate in winter but many go into diapause, a dormant state that allows them to withstand cold temperatures,” says Brian Kunkel, a UD Cooperative Extension entomologist. The mourning cloak butterfly exists in a type of diapause called freeze susceptible. It avoids freezing in much the way that car owners do -- by adding anti-freeze. This butterfly replaces the water in its body with antifreeze compounds -- called cryoprotectants -- which supercool its bodily fluids and tissues. The other form of diapause, called freeze tolerant, is used infrequently by North American insects but is a common strategy of Southern Hemisphere insects. In this type of diapause, the insect freezes its bodily fluids. Not all insects go into diapause in winter. A few, like the stonefly and mayfly, can be seen out and about in their adult form. The best time to look for stoneflies is after a snowfall -- these small dark critters are much easier to spot in the snow. The social insects take a middle-of-the-road approach to winter. They don't enter diapause, like many butterflies, but they're not bounding about, full of pep, like stoneflies. Social insects that live through winter in Delaware include honeybees, termites and a number of different ants. Many of the social insects, including ants, consolidate their living quarters during the winter, says Deborah Delaney, an assistant professor in the Department of Entomology and Wildlife Ecology in UD's College of Agriculture and Natural Resources. In late fall they move deeper into their nests and close up the exit with soil, leaves and other organic materials. Honeybees slow down in winter and stick close to the hive. The focus is on eating and huddling close to each other on cold days, notes Delaney. When the hive temperature drops below 64 degrees, honeybees cluster together into a carefully organized, compact ball. The interior bees generate warmth by vibrating their wing muscles. The outer bees are motionless, acting as an insulation layer. The colder the temperature outside, the tighter the cluster. A single bee can increase heat production 25-fold. The honeybees take turns enjoying the warmth in the middle of the huddle and then move to the outside. Not surprisingly, the queen bee reigns supreme in the middle and never takes a turn on the outskirts of the huddle. Despite huddling and other strategies, winter takes a toll on honeybees, says Delaney. Hives that may have had a peak of 60,000 bees in the summer may diminish to 20,000 bees by mid-winter. Some hives are totally lost, due to insufficient food or other factors. Worker honeybees toiled long hours in the fall, collecting nectar to feed and maintain the colony until spring. If their work wasn't adequate, there is nothing they -- or Delaney -- can do about it now, in the depths of winter. Nonetheless, Delaney checks on the hives at UD's Apiary about two to three times a week this time of year. “I hold my ear to each hive and if I hear buzzing inside, I know everything is good,” she says. “The hives are kind of like my fourth child,” admits Delaney, who is the mother of three small children.